You are near the old freighting trail of the Nebraska City-Fort Kearny Cutoff. Prior to railroad construction, thousands of wagons transported supplies to Fort Kearny and other military posts throughout the West. The Mormon War and the discovery of gold in the Colorado and Montana Territories brought Nebraska City to prominence as a freighting center between 1858-1865. Early freighters used the Ox-Bow Trail which looped north to the Platte Valley. It provided abundant grass and water but it was overly long and often plagued by muddy lowlands. Because of competition from other Missouri River towns, Nebraska City freighters sought a more direct route. The Nebraska City-Fort Kearny Cutoff, proposed in 1858 and first traveled in 1860, was first marked by a plowed furrow. Bridges and improvements were added when the famed Steam Wagon was brought to Nebraska Territory in 1862. This experiment failed, but the route continued to be called the "Steam Wagon Road." Freighting from Nebraska City peaked in 1865 when over 44 million pounds of supplies were shipped. Construction of the Union Pacific soon marked the end of major freighting on this road. 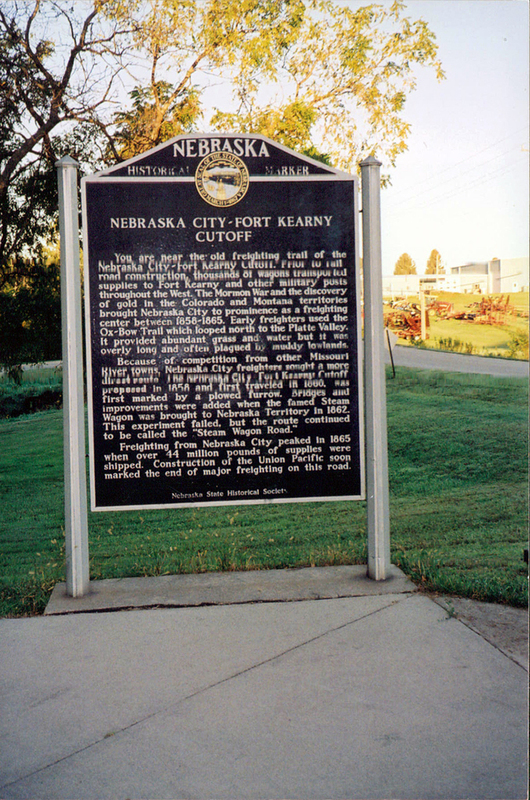 “Nebraska City-Fort Kearny Cutoff,” Explore Nebraska History, accessed April 19, 2019, https://mynehistory.com/items/show/384.